Use this mindfulness tone necklace with your meditation practice or just to center yourself throughout the day. 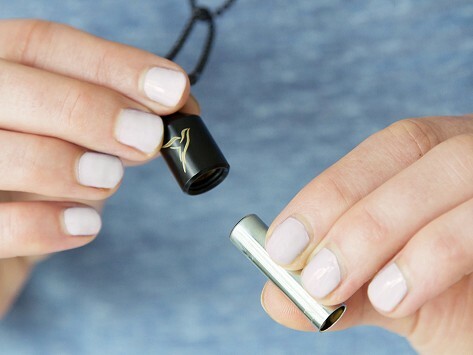 It holds a tiny flute which plays a single note at 528 Hz. Also called the “Love Frequency,” this tone is believed to help calm our minds and bodies. Wear it to center yourself in a peaceful space any time or simply as a reminder of the loving vibrations around us. Dimensions: Pendant: 1.75" x 0.5" diameter; Chain Length: 16"
Cool as a pice of jewelry alone but fun to have as a breathing tool. It surprisingly makes you slow your breathing down. I can’t help playinghelp playing it while I drive. Unfortunately, my kids think it looks like I’m vaping. It’s not always easy to practice mindfulness. Wearing a mindfulness tone necklace keeps some helpful guidance within reach. 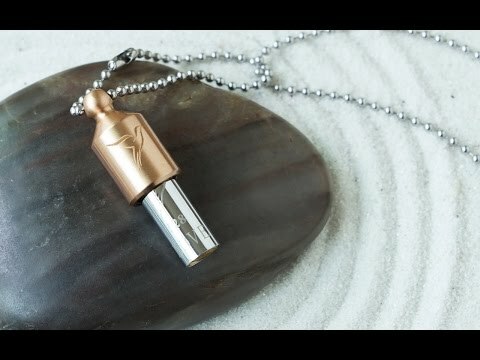 The Lovetuner holds a single-note flute that plays 528 Hz, also called the “Love Frequency.” Many people find that, like the sustained vibration of “Om,” this note calms them and reduces stress. Founders Sigmar Berg and Tom Rohner are believers in this tone's positive effects on our minds and bodies. With Sigmar’s talent as a designer and Tom’s skills as a spiritual lightworker, they created this Made in the USA necklace to hold some calming influence close at hand. They aren’t the only ones who believe in the healing power of 528 Hz. It's referred to as the “miracle note” on the original Solfeggio musical scale, used by ancient priests and healers for its peaceful properties. If you doubt that sound can deeply impact our bodies, think about the stress created by certain sounds (nails on a chalkboard, anyone?) versus the soothing hum of white noise. Besides its spiritual positives, the necklace adds an understated edge to your attire. Use it in your meditation practice, to center yourself in a peaceful space, or simply as a reminder of the loving vibrations around us.